It was bound to happen; the question is why it took longer to start than some of the other musical genres that have saturated China's eastern cities. Granted, rock will always equal cool, electronic will always sell and jazz will always be sophisticated, but in a place so rich in communal gatherings, not to mention knee-deep in folk tales, why has reggae taken so long to catch on? Scratch those dreads no more¡ªit's happening with the arrival of three time Grammy winner Ziggy Marley in March, and it's bound to be the first of many "buck ups." "[China has a] rich culture, great history. It is a great historical country to mankind. China is relevant to the history of human beings. I am honored," says Marley of his upcoming shows in Beijing and Shanghai. Marley's appearance comes on the heels of Roger Waters as the first big acts of 2007, but how will the P.R.C. react to Jamaica's most popular music? "Looking at Japan and how it's caught on to reggae with their own Japanese reggae artists, China is definitely next on the list of reggae's Asian circuit," says MC Mojo, a Shanghai performer and one of the forces behind the popular "Back to the Roots" series. "You can even listen to ads on the radio with tropical West Indian sounding melodies and beats." Which brings up another major catalyst for the Jamaican movement here¡ªthe love of all things "urban," meaning that teenagers trading their "NY" cap for a multicolored "Rasta knit" might not be that far away. Any look at this addictive sound will always conjure up two artists: The first being the obvious, the original Rasta man Bob Marley. When asked about the legacy of his father, Marley hopes people will "remember him as a messenger of creation who came to enlighten people and spread positive vibration." The second great reggae master who comes to mind is Jimmy Cliff, who penned it all best in "Reggae Nights" with this: "There'll be people comin' from the north and south and east and west, so you better look your best, man. Now, lightning' strikes at eight, so you better not be late for this rub-a-dubbin', rockin', jammin', fun, fun, lovin', yeah." 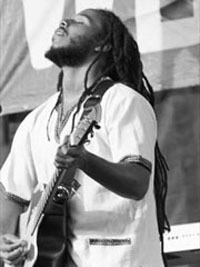 And next month, we'll be able to watch a legend in his own right perform (the second Ziggy Marley show for this writer, who after seeing him headline "Sunsplash '91" in Jamaica at the age of 14, sought out the only establishment in Texas that would allow a skinny white kid to get "nappy dreads"). "Pay attention to Santa Davis, our drummer, and Sticky Thompson, on percussion, these are two legendary Jamaican musicians," says Marley of his band. But how is reggae, in its infancy, being accepted to date in China? "It is still a small scene," says Beijing based DJ Mael, who's been spinning dub reggae in all of China's major cities for the past few years, "with not much support yet. Aside from the hype coming from young, cool cats, reggae is still a respected musical genre." The question remains though: What happens after Marley's final steel drum has been packed away? Will the Kingston sound resound in the Middle Kingdom? "The vibe is here and I think with better communication and more regular major events the scene could grow real fast," says DJ Mael. Being on the cusp of something new is the most exciting draw, and with the initial movement of one of the world's most highly embraced musical genres into China, we're all in for a ride; in other words, "people get ready."